Can you take the heat of The Atomic Fireball? Wow, I love these. The name, no doubt, came with our post-war atomic obsession. Funny thought: do you think people had these stored in their bomb shelters? I keep these at my desk. They are one of the few candies that are almost impossible to over-eat. These jaw-breaker type candies were introduced in 1954 by Nello Ferrara. According to the Ferrara Pan candy web site, he wanted to make a spicy candy. They were an immediate success. They are created using the “hot panned” method where the candy is built up in layers.The outer shell of the Fireball has a pleasant cinnamon flavor, but suddenly it gives way to FIRE! That spicy ingredient that setting your tongue ablaze is Capsaicin, which has been studied as a medicinal remedy, so enjoy all you can handle! They can get so hot that you have to take the candy out of your mouth for a moment, so don’t eat these in a business meeting. The Ferrara Pan candy company estimates that 15 million are consumed weekly! 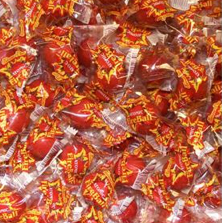 Visit their site for more Fireball trivia and a video that shows the candy making. Posted in Childhood memories, Cinnamon, Hard Candy. Bookmark the permalink.